Sign up to receive news and updates on events from Grow North as well as news from the food and agriculture community in Minnesota. We aggregate resources in one digital destination so entrepreneurs, resource providers and more get what they need in fewer clicks and coffees. We have over 200 resources in Grow North's Resource Navigator database and are always look for more. Our programs strive to 'democratize the accelerator' and give broader access to high quality, industry specific education as well as drive interconnectivity across the food and agriculture sector. We lead large scale events to drive connectivity and visibility for Minnesota's entrepreneurs, innovators and the entire ecosystem. We make it easier to navigate and maximize Minnesota's growing ecosystem by acting as a starting point for scaling businesses as well as organizations and individuals who want to get more involved. 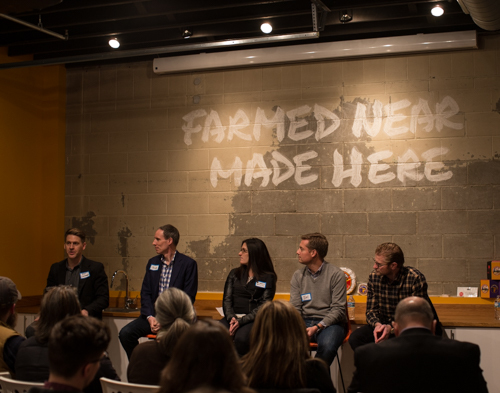 We represent Minnesota as a sought after speaker at leading industry events and also convene leaders to drive collaboration across different communities within food and agriculture. Interested in getting more involved in Minnesota’s ecosystem? Collaborating with grow north?